When can I use my unlimited NYC MTA Metrocard again? If you’re visiting New York or get on the New York City subway or bus (MTA) at least four times a day, we highly recommend you get an unlimited ride Metrocard. For the visitors, you may want to checkout my previous blog to see NYC in a day (or two). 1. You cannot use the unlimited Metrocard within 18 minutes of your previous use (also known as “swipe”). 2. You cannot swipe in other passengers for a fee. These terms don’t prohibit you from swiping your friends in for free. And, the 18 minute hold on your Metrocard only applies to the station you swiped in at. If you go to another station (NOT another turnstile across the street for the same station; an entirely different station), or a bus, you can swipe your unlimited card again, before the 18 minutes is up. 1. 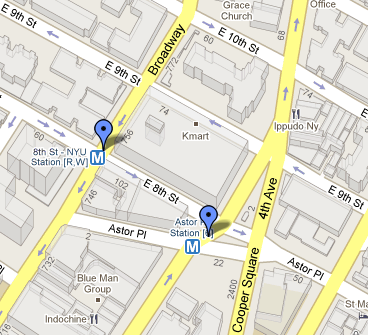 Swipe your friend in at Astor Place for the 6 train. 2. Walk one block over to the 8th Street station and swipe in to get on the N, R or W train. 3. Use the same card to get on the M6 bus to go down Broadway. 2. Walk one block over to the 8th Street station and swipe in. 3. Go back to Astor Place for the 6 train. Unless 18 minutes passed between step 1 and 3, the card won’t work. You can, however, walk up to the Union Square 14th Street station to reuse the same Metrocard. Hope this helped you maximize the usage of your Metrocard. You may want to use this opportunity to check out all the skating rinks in NYC – check out Omnifarious’ previous post.